Several years ago I posted a blog refuting a sermon on “Once Saved, Always Saved” by Pastor Charles Stanley. This view of salvation is also frequently called Eternal Security. Today a man named John posted a response (copied below in brown text). He purports to have not tradition – simply the Bible alone. It is so fraught with errors that it borders on humorous if it were not so blind and sad. You can read it below. I reproduce it here as he sent it with all the misspellings and errors intact. I will make no comments on his typical Fundamentalist Protestant tradition. You can analyze it for yourself and make note of the skewed view of Christianity, the Bible and the Church. There is much of what he says that is true (mainly in his second paragraph) but the context of his statement is a “me and Jesus” approach to the faith and an “interpret the Bible for yourself” mentality that has led to so many errors, sects, cults and confusion. What actually happens is a guy like John actually makes himself a pope since he is the final word. I wrote to John and thanked him for his Comment and told him reading things like this makes me so glad I discovered the Catholic Church, having once parroted the same kind of thing in my former life. Enjoy! 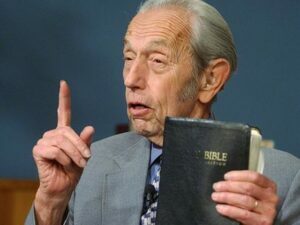 JOHN WRITES: All we have and were given by god through the apostiles were the 66 books of the bible. The catholics added their pound of baloney including the pope, mary, pergatory, holy water, mass, etc. The protestants reformed what they felt necessary based on the bible, and came up with many different loafs of their baloney. I believe you are correct in criticizing the flawed use of the sinners prayer. The truth exists in the bible. Jesus died for the elect. His sacrifice washed away and washes away our sin. Jesus is our ( the truly saved) mercy seat. God’s righteousness is imputed to us. His holy spirit guides us and sanctifies us. His blood covers our sin. The only clue we have of our redemption is our changed heart, that seeks to honor his stated will and glorifies his name. Work out our salvation with fear and trembling. Until called home to heaven, wrestle with our old man and repent when we fall short. Since Baptism by “water and Spirit” came up in the comments below, HERE is a link to the topic of Baptism. They are young, educated, joyful, beautiful, determined, God-loving, hopeful and ready to serve. 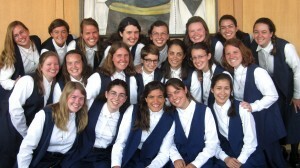 They are postulants with Sisters of Mary, Mother of the Eucharist. They live 10 minutes from our house in Ann Arbor Michigan. They started out with five about ten years ago and are now well over 100 with branches springing up across the country. Meet our newest members…our postulants for this Year of Faith!! Aren’t they beautiful!!! All God’s doings!! We thank Him – and each of you as your prayers, love of Religious Life, support, fidelity to your vocation help us all in ways we’ll fully know in that great “Someday” that’s coming — HEAVEN! !